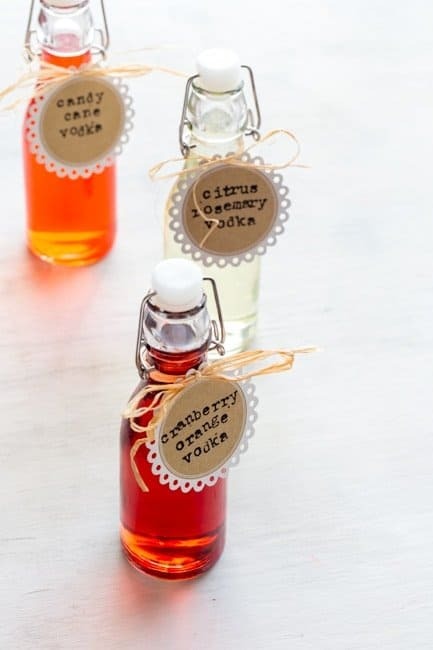 Infused vodka is a fun and unique hostess gift for the holidays. 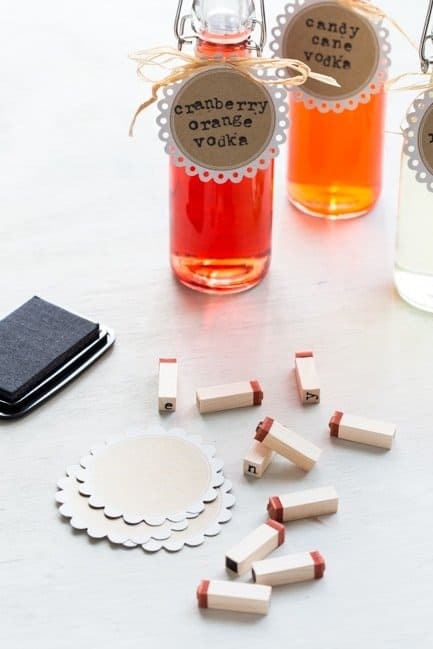 Vodka can be infused with a variety of flavors from citrus to candy canes! If you’re like me, then you love shopping for Christmas gifts. It’s never seemed like a chore to me to choose the perfect give for everyone on my list. Some years, I get my shopping done extremely early, and other years (like this one, for instance) I tend to spread my shopping out over a long period of time and perhaps even wait until *gasp* last minute to find the right gift. That being said, I don’t appreciate the multiple emails a day in my inbox that are telling me that “time is running out” and that “there is still time to choose those last minute gifts”. It’s the first week of December! By no means is this last minute, and it irks me that stores try to get me all stressed out that I don’t have my shopping done yet. Just to prove to you that we all still have plenty of time to choose your holiday gifts, here is an awesome homemade edible gift idea that takes several days to make, but with very little actual hands on time. Yes, infused vodkas are easy, impressive and delicious, but they do take a few days to make. But no worries, right? We all still have plenty of time! For the Citrus Rosemary Vodka, I combined clementines with a bit of grapefruit and some aromatic rosemary. It’s like a cocktail version of my Rosemary Citrus Spritzer. The Cranberry Orange Vodka has notes of cinnamon and clove for a warm, holiday feel and the Candy Cane Vodka is full of pepperminty flavor. Simply place vodka and your desired flavor infusers in a mason jar and allow to steep until the the vodka has taken on the flavor of your added ingredients. The process couldn’t be simpler! 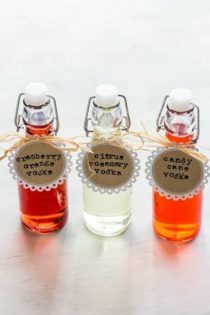 These vodkas make perfect hostess gifts for the holidays, especially when decanted into fancy bottles or even sweet little mason jars. Tie a hand stamped gift tag around each bottle for a complete package. Don’t let your email inbox bully you into thinking you’ve run out of time. Relax, make some infused vodka and sip on a yummy holiday cocktail. You totally have time! Combine all ingredients in a quart sized mason jar and screw on lid. Allow mixture to infuse for 2-4 days, shaking 1-2 times a day. After vodka is infused, strain out all solids through a cheesecloth and decant into a fresh bottle or jar. Allow mixture to infuse for about 30 minutes. After vodka is infused, strain out all solids through a cheese cloth and decant into a fresh bottle or jar.